After wasting four nights in Seville we opted for two in Lagos, leaving our options open to stay longer if we liked the place. 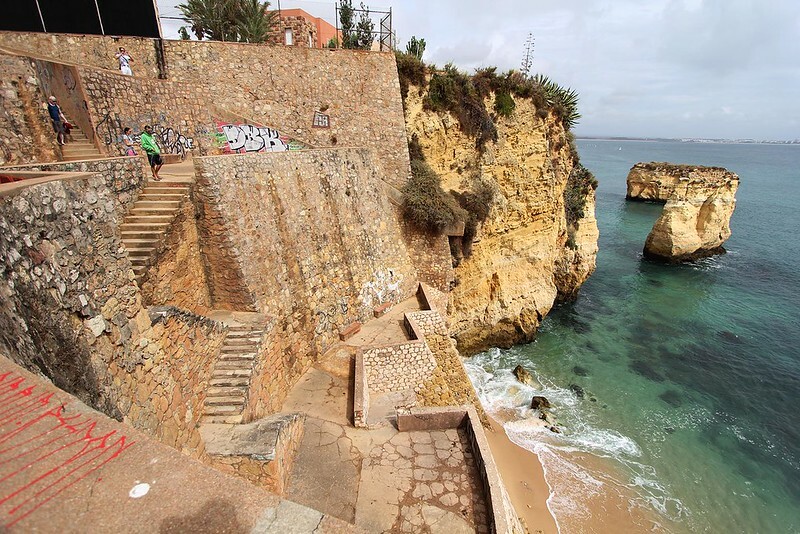 Lagos is on the southern coast of Portugal, about five hours by bus from Seville along a rather dull stretch of highway. It’s a little town with an old vibe – and it’s not just the buildings. This is equivalent of Noosa to Europe’s Melbourne. Retirees from England, Germany and other richer countries buy apartments here, or just descend in motorhomes to soak up the sun and bake themselves gently on the golden beaches. Although how they manage all the stairs I have no idea. Lagos has a reputation for being a bit of a party town too, with a few nightclubs and bars for the younger crowd but the season was ending and we weren’t really in the mood anyhow. All the restaurants have menus in English and German and there’s a long promenade along the waterfront, lined with palm trees. It’s not a place that screams ‘culture’, but it’s certainly an easy spot to spend a few days. We walked around, ate some Portuguese food but didn’t spend any time on the beach because it was raining on and off the whole time. If it wasn’t for the Portuguese bogans (chavs/rednecks) screaming outside our window each morning and night we’d have had no excitement at all. We thought about staying longer but the lure of England after months of not speaking the local language was too strong. 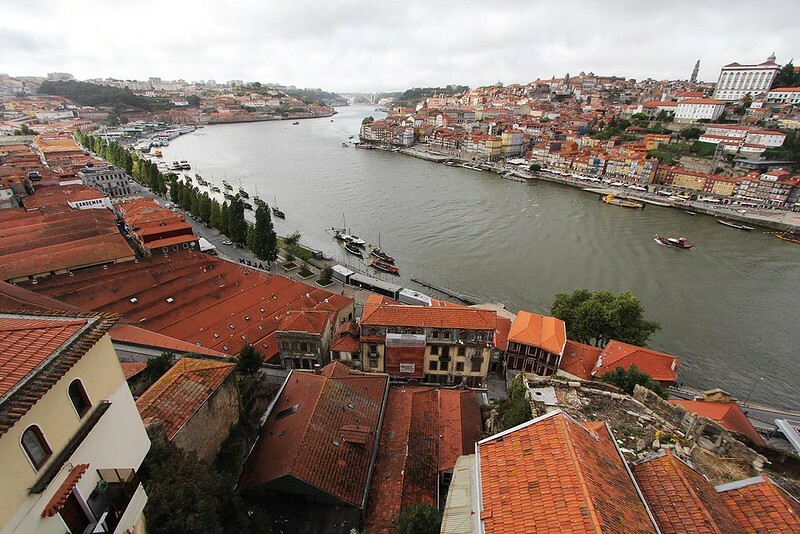 However, we decided on one more stop – Porto in northern Portugal. View of Porto, taken from the south side of the river. We caught 3 trains that took us all the way from south to north. Irritatingly, no one seemed to bother about sitting in their assigned seats. This was only an issue for us because on an overnight bus in Turkey we’d gotten on and someone had been sitting in our seats but the man at the bus terminal had said ‘don’t worry, sit anywhere’. Then we stopped at the next place (very late at night) and the new guy made everyone get up and find their own seats and sit in the right place, which was a pain but should’ve been done at the first stop. Why bother assigning seats if you don’t care where people sit? Assigned seats are much to be preferred though – we caught a Ryanair (world’s most hated airline) flight back from Porto (trust me, if it wouldn’t have cost us several hundred euros more we would’ve happily spent 24 hours training it back to the UK) and watching everyone waiting for their unassigned-seat flight was ridiculous. People are much less relaxed, the flight staff have to cajol idiots who leave spare seats in the middle of rows when it is obvious the flight is full… GAH! I can feel my blood pressure going up just thinking about that company. Don’t get me started on their hidden fees, baggage restrictions, and their sly wallet-gouging techniques. A pox on their house. But Porto! Porto is beautiful. Really beautiful. And I can say that unequivocally because we saw it in mostly crappy weather and it still made a great impression. From above Porto reminded me of a very large Cesky Krumlov – all those red roofs and the river flowing through. For the uninitiated, Porto is home to the drink, port. No surprises there. 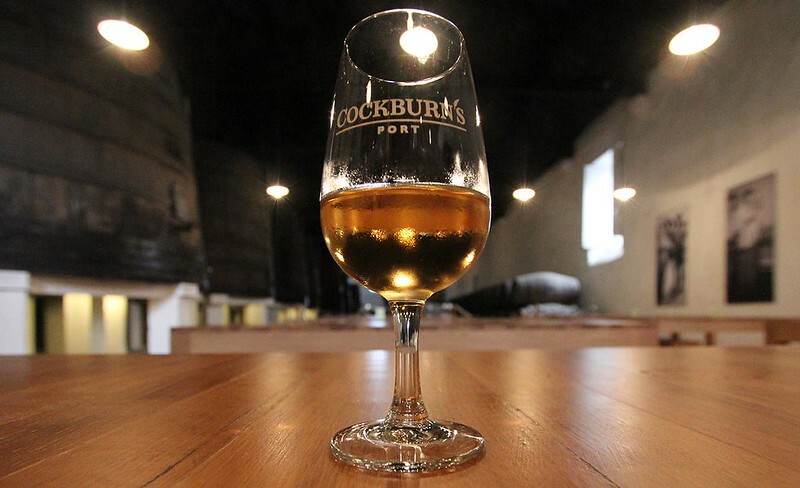 We went on a tour of a port house (ignore me calling them wineries on the video when Luke gets around to it) and learned a bit about the history of the drink and the place. Turns out that when England and France went to war several centuries ago and the English could no longer get their hands on French wine, they turned to Portugal to satisfy this need. They discovered that adding brandy to the wine kept it in good condition on its journey across the sea and also produced a much sweeter flavour that appealed very much to the English palate – hence port being a ‘fortified wine’. Only fortified wine from this part of Portugal may be called ‘port’. Many Englishmen moved to Portugal to produce this new drink, hence the fact that the port houses mostly have English names. Some port houses are still owned and run by the same families that started them in the 16th century. Most people are familiar with ‘ruby’ and ‘tawny’ port but there are also white ports and rosès. We spent our first morning in Porto walking around the port houses and doing tastings. We tried several ruby and tawny ports, two whites and one rosè. Here’s an article on rosè port with a good description of how it should (could?) be consumed and its history. We enjoyed all the ports we tried; the whites were comparatively drier and my favourite was the tawny, with its more caramel, rather than fruity flavours. I have tasted port before but it’s certainly not my go-to after dinner drink. This might change now I feel a little more confident and knowledgeable about it. Some of the more interesting facts I learned on tour was that ruby and tawny ports start off as the same grapes and it is their storage methods which change their taste and appearance. Ruby is stored in large oak barrels and tawny in much smaller ones. It is the greater contact with the oak that changes the tawny into a nice amber colour and the flavours alter as well. 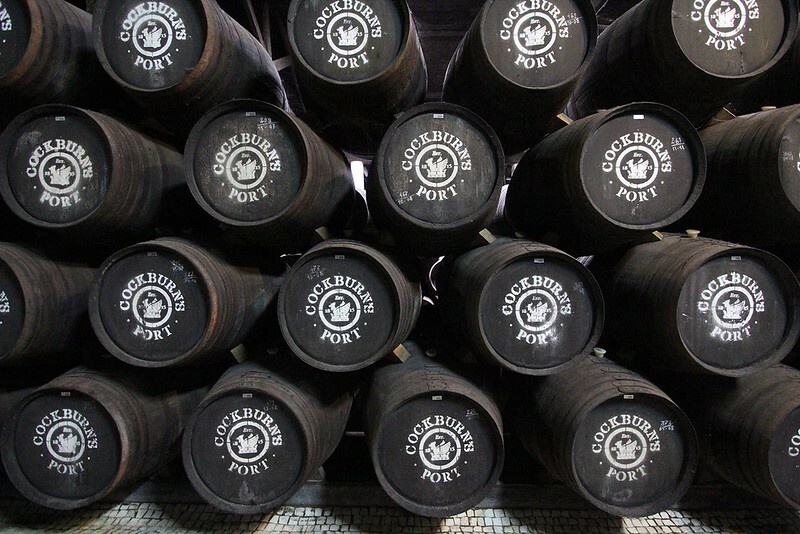 The barrels that are used for port are then sent to places like Scotland for whisky production as whisky cannot be aged in a new barrel, it needs the flavours imparted by aged and used oak. A note on going to Portugal and doing the tastings – we stopped at only three port houses but there are quite a number on the south side of the river, all within a fairly small area. They sit at various levels above the river on a very steep hill. The best idea is to pick whichever you intend to visit, get the cable car up from the riverside or cross the bridge to the highest point and then wander downhill with a map and use a GPS device (like google maps) to give you the best route – there are some paths which cut through blocks and will save you slogging up and down huge hills. This bridge is most convenient – you can get from the highest point on one side to the highest point on the other side, or cross at the river level. The tastings were mostly 3 euros for three varieties. Each glass at each house was about 100mls, which looks like a small amount but most definitely is not when you have eight of them – and port is generally around 20% alcohol. My advice is eat a big breakfast (or lunch, depending on when you go) and then you won’t end up with a mid-afternoon hangover. Or you could, y’know, not drink over a bottle of port in a few hours. With all the port houses so close to each other though, it’s very tempting to try to get to as many as possible in one outing. 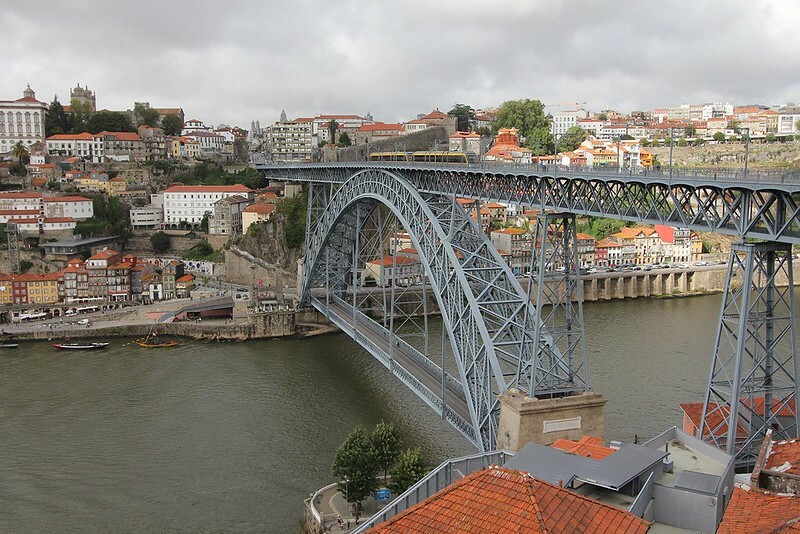 Plus there’s plenty of other things to do and see in Porto, so don’t spend all your time there drinking. Although it is tempting. Before I move on to other things, here are the places we visited and a few notes. 1. Taylor’s. This port house is fairly far uphill and styles itself as very upmarket (and is – one of the bottles on sale was 2500 euros). 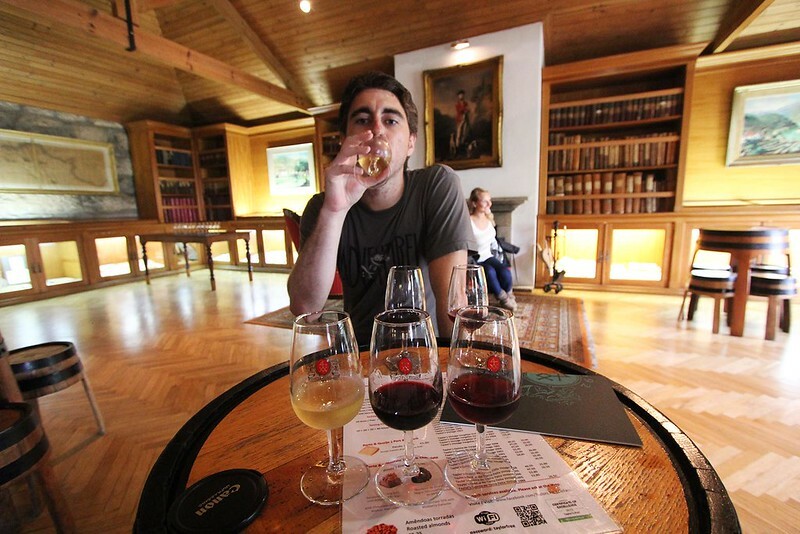 However it was still only 3 euro per person for a basic three glass tasting. 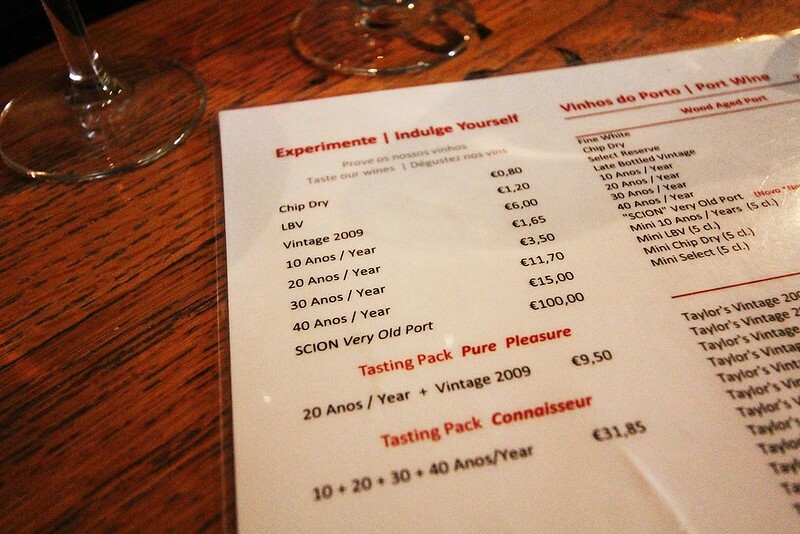 You can pay more for tastings of their more expensive ports. Their English language tour goes at 2pm and we were too early so we read their little guidebook, tried the port in their very pleasant tasting room and watched a short video on their vineyards and history. 100mls for 100 euro? I’ll have two! 2. Cockburn’s. (Don’t forget, pronounced ‘Coe-burns’.) This port house had a much more casual air than Taylors and we joined a tour that ended up being only six people and took about 20 minutes. We looked at the barrels, a map of the Duoro Valley where the grapes are grown and then tasted three ports. They were nice enough to give us a glass of white for free while we waited for the tour to start. This house also offers picnic lunches in their pretty courtyard under grapevines, but at 15 euro pp we didn’t bother. Plus it was raining so an outside picnic wasn’t all that appealing. The guy who did our tour had excellent English, encouraged questions and the whole experience was excellent value. Luke and our guide, Sergio. 3. Quevedo. Just back from the waterfront, we weren’t actually planning on having any more port because we felt quite… jolly from the seven glasses we’d already had. However, when we bought tickets for the cable car (5 euro each) up to the bridge it came with a free tasting at this nearby house. So off we went. 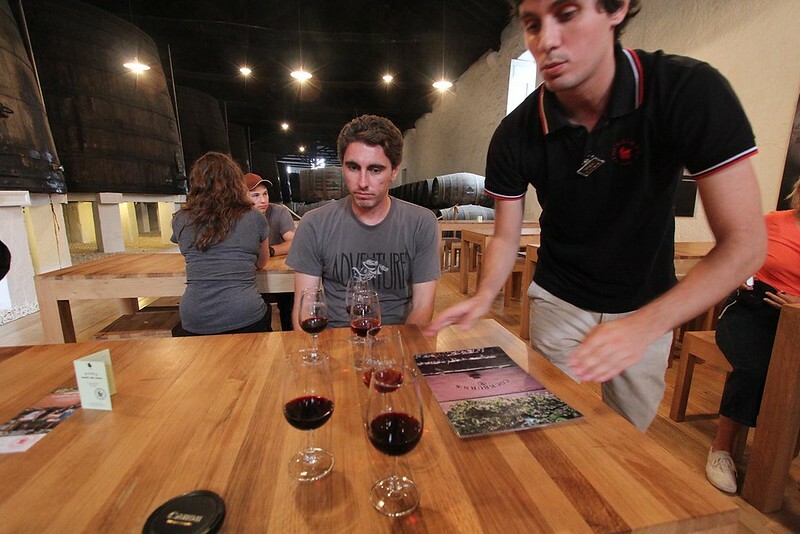 Quevedo has a large room with explanatory panels around it so you’ve got something to do while you binge-drink. We chose two different ports, including a rosè, and shared – something we should’ve been doing from the start. Their port was ok – the rosè was quite nice and almost strawberry-flavoured. Just a note – their website is a blog and talks about what’s going on with the current harvest, which might interest some of you. I’m a bit sad that we only did three port houses but if we’d kept going we’d have missed out on many of the other great things Porto has to offer. Which I’ll get to in my next post! The more the merrier! Just making our plans to meet up with Lucas again in London in a couple of weeks, should be fun! Lovely post and inspired to visit Portugal & Porto someday! Why thank you!And do, it’s lovely:). I bought an amazing white port from a little winery in WA a few years ago. It was pretty sweet but I followed the winery’s suggestion and had it with ice and a slice of lemon…best summer drink ever!